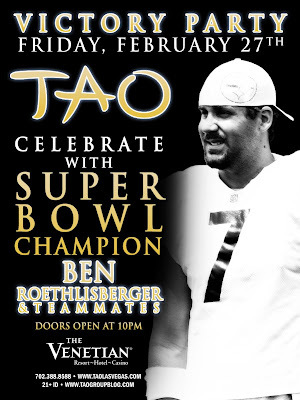 While his teammates are robotically signing Super Bowl 43 DVDs at 2 AM in a Best Buy, Ben Roethlisberger's got a better idea: hosting a Victory Party at Tao in The Venetian in Las Vegas tonight. The doors open at 10 PM, which means Large Ben (and unnamed teammates) will probably have a late night. Hopefully none of those teammates end up bashing in a towel dispenser at 3 AM. Actually, Big Ben News has the list of other players who will attend: Charlie Batch, Darnell Stapleton, Willie Colon and Trai Essex. Apparently this party is limited to quarterbacks and linemen, which are presumably there to protect Roethlisberger just like they do at work. Well, at least some of them. It's sad that when Ben is surrounded by his offensive lineman, even off the football field, he feels it is necessary to have a back-up QB nearby.